Our personalized money clips are the perfect gift for the special guy in your life. 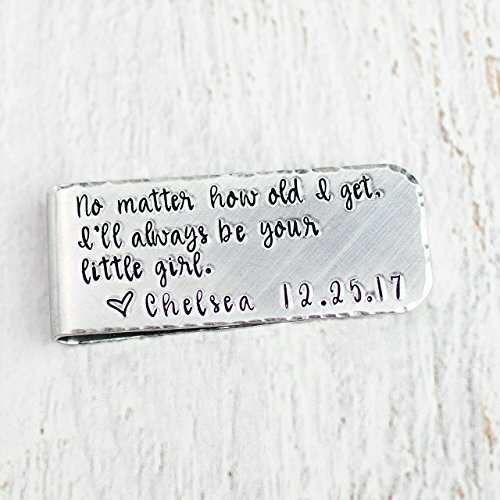 We will hand stamped your custom text on the front of the clip, up to 75 characters. On the back we can stamp a name and a date. Made of lightweight aluminum, it is comfortable to keep in his pocket, and does not tarnish or turn color! After stamping, the money clip is given a brushed / matte finish, the edges are hammered and it is formed into the clip. Comes in our men's gift box with stretchy silver ribbon. If you have any questions about this product by Jessie Girl Jewelry, contact us by completing and submitting the form below. If you are looking for a specif part number, please include it with your message.